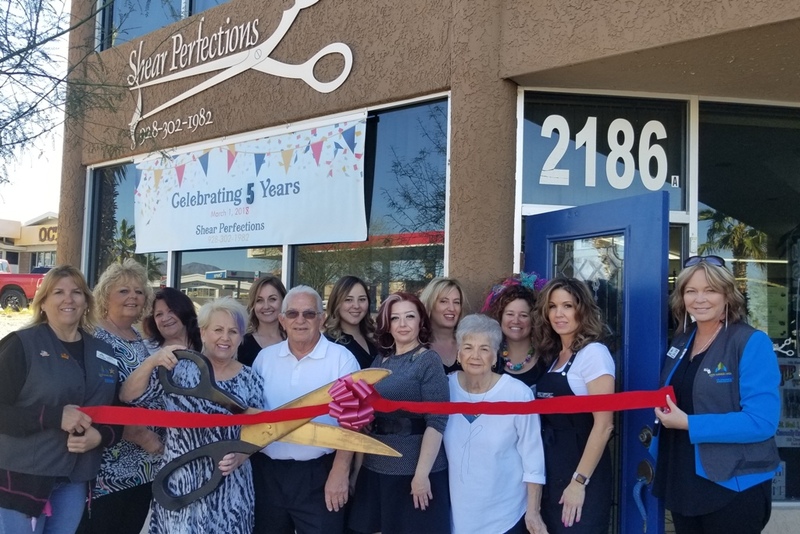 The Lake Havasu Area Chamber Ambassadors held a ribbon cutting ceremony for Shear Perfections LLC, located at 2186 McCulloch Blvd. N. #A. Shear Perfections is a large, full service hair salon with over 45 years of experience. It offers a relaxed, happy, family friendly atmosphere with talented stylists, and featuring Lipscense by JoAnn. Attending the ceremony from left to right were Janina Robertson, Cathey Fielding, Maria Rash, Terrie Colella – Owner, Maegan Mueller, Al Colella, Ashley Driggs, Jennifer Martinez, Jennifer Rascon, JoAnn Hight, Johna White-Fox, Heidi Doyle and Kristal Jacob.